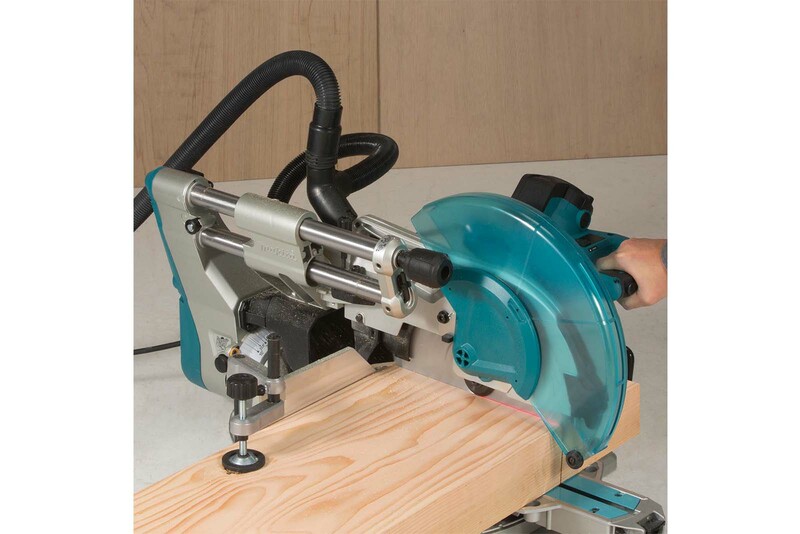 The new LS1219 305mm Slide Compound Mitre Saw joins the family of Makita saws that benefit from the new design of the sliding motor head layout allowing it to be operated close to a wall making it ideal for bench mounted applications. The twin slide rails are set at an angle in the rigid aluminium alloy chassis frame, while the rear chassis fixing is positioned right at the rear of the saw assembly. The robust rails allow the saw head to move forward to cover the total sawing zone without the wasted movement of the motor head passing back behind the sawing zone. The new LS1219 mitre saw has a no load speed of 3,200rpm and features a bigger mitre and bevel range than its predecessor the LS1216. This new mitre saw has class leading mitre and bevel capacities – 60° L to 60° R mitre, and 48° L to 48° R bevel. A front knob enables easy bevel adjustment with easy-to-operate mitre angle lock and one-touch sliding head lock. The LS1219 benefits from DXT – Deep and Exact Cutting Technology – and the 12” blade has an impressive 72 tooth count which has been developed to dampen vibration and be super quiet to enhance the work environment. This also improves both durability and reliability of the saw blade and equipment. A lower vibrating blade produces greater cut accuracy, and also reduces wobble, giving a beautifully cut surface.